International logistics specialist Marine Maroc, based in Casablanca, has recently used a four modular combinations of Cometto self-propelled trailers MSPE 40t in side-by-side configuration for heavy duty movements in Sub-Saharan Africa. 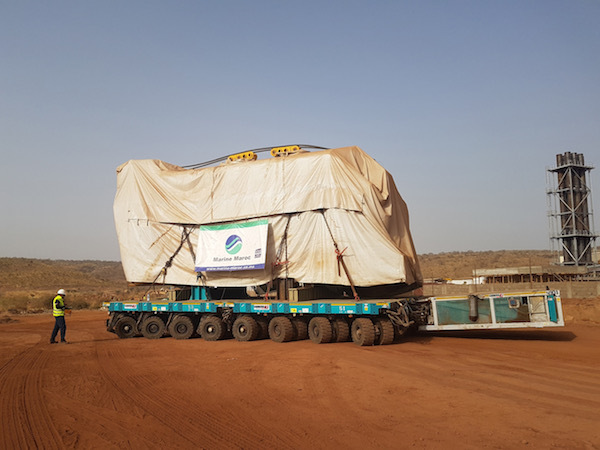 This project involved the transport of six diesel engines each weighing 215t and six generators each weighing 72t for the power plant of Kayes in Mali. Marine Maroc handled this operation for its final customer Bolloré Logistics on behalf of BWSC Denmark. The Cometto MSPE is a part of their vehicle park since 2013. The semi-trailers manufacturer offers four interchangeable series of MSPE having capacities up to 70t per axle line for the newest MSPE Evo3.